The Coming of the Toa is the first comic in the BIONICLE series. The comic begins as Toa Mata Kopaka's Toa Canister lands at Mata Nui before an audience of Ussal crabs. He awakens and blasts open his Canister. He pieces himself together and, heading toward the mountains, meets the Ko-Matoran Matoro. The Toa of Ice sees the Matoran as an enemy, and attacks him. However, he is soon realizes that Matoro is not a foe, and Kopaka is consequently informed of his summoning to Mata Nui and his quest to collect Kanohi masks. The pair then proceed to go to meet with Turaga Nuju. As they walk, they are ambushed by a Nui-Rama, which causes Matoro to fall over a cliff. Kopaka quickly saves the falling Matoran, and both land on top of a flowing stream of water which Kopaka freezes. They are soon met by Turaga Nuju, who tells Kopaka more of his quest and the trouble which Makuta Teridax had brought on the island. He then tells Kopaka to look for the masks, the first of which is at a "place of far-seeing". Kopaka then departs for Mount Ihu, in search of his first mask, a Kanohi Hau. As he scales Mount Ihu, Kopaka is meets Pohatu, who accidentally buries Kopaka in a pile of rocks whilst "practicing" his skills. Freeing himself, Kopaka reluctantly allows the Toa of Stone to travel alongside him. Shortly afterwards, Kopaka finds the object of his quest, tests it out, and then quickly descends the mountain with Pohatu, as he saw "beings of great power". They soon find themselves in the company of the other four Toa Mata. 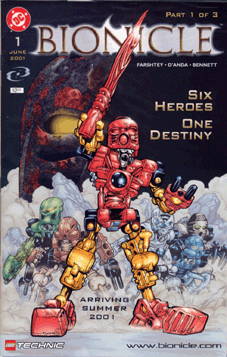 First printings of this comic had the words 'Arriving Summer 2001' stamped between Tahu's legs. This was removed in the digital version. The comic was later re-released in 2003 at San Diego Comic-Con with a new cover from artist Ashley Wood among some slight changes. In some parts of the world, the re-released comic came packaged with a poisoned Kanohi Hau Nuva. This page was last edited on 13 February 2019, at 05:03.